What happens when you use technology from the future to rebuild the world of past? Nostalgic developer Roy Lazarovich is trying to figure that out with a new project called MemoRift. Put simply, he's building a bedroom from the 1980s that you can explore using Oculus Rift. So far, Lazarovich has managed to emulate a number of 8-bit video games that essentially let you play classic games in virtual reality. He's also working on digitizing old gaming magazines like Nintendo Power so that you can flip through them while wearing Oculus Rift. If you think about it, those very games were a sign of the future when they hit the market—and left many people wondering what it would be like to step right inside the screen. This was a time when virtual reality seemed totally attainable. And yet, here we are 20 years later, using virtual reality to go back to that very time. This project isn't just about Super Mario Brothers and our endless fascination with old, glitchy games from our childhood. Lazarovich says that the environment he's built so far is really just an example of what's to come. Beyond the 1980s bedroom, he says, "the idea is to build a framework which can be used by anyone to easily create their own room based on their own memories and interests." 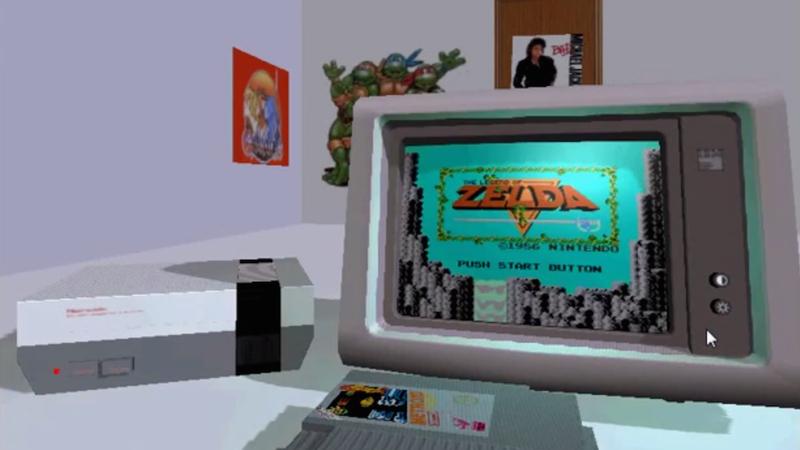 Can you imagine building your childhood bedroom so that you can put on Oculus and pretend like you're five again? How about your grandma's kitchen or your first college dorm?